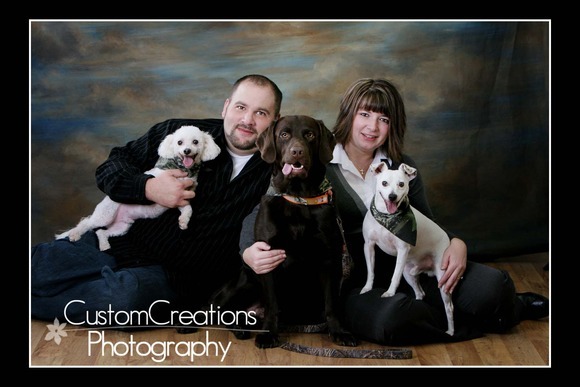 Meet Sarah and Mike and their dogs! They came into the studio for their family session on the day of our blizzard! I called them to double check they were still coming in, as it was a late evening appointment. They live right in town, so they had no worries getting to the studio! The dogs were so incredibly well-behaved and adorable! I just love the tounge-hanging-out look!! I get a lot of calls from clients wondering if they are allowed to bring their pets in, and then they admit they feel weird bringing their pets in for photos! I LOVE LOVE LOVE the fact that people bring their pets, it adds so much character to their portraits!! Here is a small peek at their session!